Proceeds from new listings were at the lowest level in more than a decade last year. Yet the stock market is up 22 pct since September on hopes of an election win by opposition leader Narendra Modi. If expectations become reality, India could see a shower of new offerings. 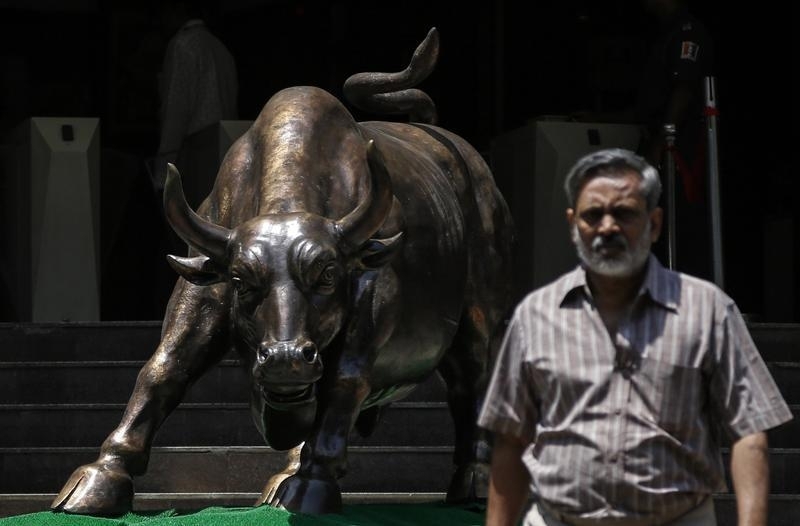 A bronze bull sculpture is seen as an employee walks out of the Bombay Stock Exchange (BSE) building in Mumbai April 1, 2014. Indian companies raised $343 million through initial public offerings in 2013, the lowest amount in more than a decade. That compares to $1.3 billion raised in 2012, $1.4 billion in 2011, and $8.4 billion in 2010, according to data from Thomson One. Activity in the country’s wider equity capital market has been buoyed by follow-on issues from companies that are already listed. Over $8.8 billion of follow-on stock was sold in 2013, dominated by the sell-down of the government’s stakes in energy companies including Coal India and power producer NTPC. The benchmark CNX Nifty index has risen 22 percent since the start of September.